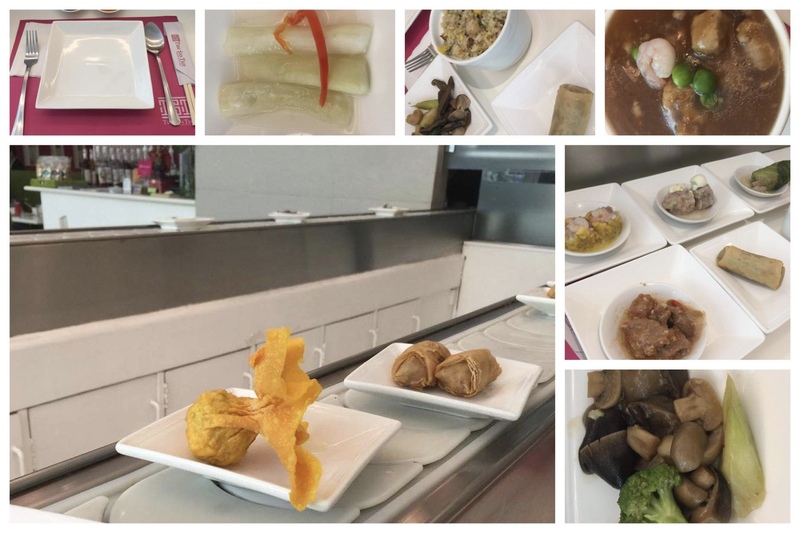 Three weeks ago I got to dine at Tsim Sha Tsui Dimsum and Tea Bar a restaurant that is known for their “Hong Kong style, conveyor belt table service”. I have visited this restaurant 5 years ago with @poeticnook, the place was somewhat new then so now it’s time to review and revisit it. So I was there last October 27th and this time with fellow content contributor @Drei. I arrived around ten in the morning to make table reservations for two for an 11 a.m. brunch. But I guess I was too early because the restaurant was still closed at that time even though the mall was open. To pass time, I went to a nearby tech store and bought a mini-tripod for my camera-phone. I returned fifteen minutes before 11a.m. and waited for the waitress to reserve a table for me, but it seems there was no need for it because there were many tables available. Finally, Drei arrived and we were seated alongside their “famous” table. The waitress offered us rice meal cups to compliment the dimsum dishes, I got the Yang Chow Fried Rice and Drei got the Steamed Rice. She also served us two refillable glasses of iced tea which comes with the buffet. And then the conveyor belt moved, its time for some Chinese dimsum! First, they rolled in two appetizer dishes on three dimsum plates, which we took one of each kind. We got the mushroom and mixed vegetables side dishes. Next came the main attraction, this is why we came here. We got siomai, siomai with egg, empress roll, chicken feet, breaded pork cutlets, steamed strips of tripe, and shanghai rolls. Each were served in two’s or three’s on each plate. It was like a dimsum train that encourages you to take one, or two, or more. They also have fried wonton, machang, and hakaw. For dessert, I finished it off with buchi and a white jell-o like maja dessert which was good, but forgot its Chinese name. The lunch buffet cost around Php.398.00 ($8) per person with rice and drinks included. That price is ok considering its a dimsum buffet in ACC. Some restaurants in the Terraces vicinity will charge you around 120 per dish or more depending on the place. But if you are a big eater who loves a quick dimsum fix this place is for you. Here’s my F.A.V.E.S and R&R rating. Rate Guide: Bad,So-so,Ok,Good, and Great.